Statement bib necklaces made from polymer clay rock! That's because you can really go to town with them. Here are 5 awesome design tutorials to inspire! Mo Clay is especially creative with this necklace style. 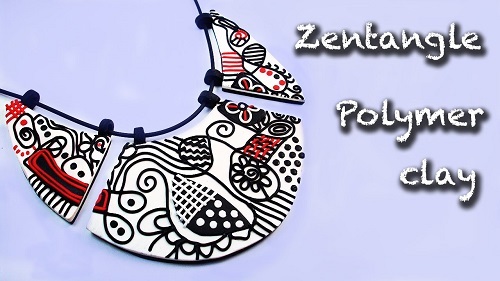 Her zentangle inspired polymer clay bib necklace tutorial will surely appeal to doodlers everywhere! Here you will be doodling with long extruded lengths of polymer clay! I really like how she made little tabs for the necklace portion. Mo Clay's easy peasy transferred image polymer clay bib necklace tutorial is a great one for people who like to doodle with colored marker pens. I like how she edged all the pieces with a contrast colored clay. This makes her necklace look like broken china jewelry! She also has a clever polymer clay bib necklace tutorial where she used part of a recycled CD for the support. She shows how to remove the colored portion of the CD so you can use the transparent form. She also has a fun ruffled bib collar polymer clay necklace tutorial. This one reminds me of fabric flower bib necklaces! Patricia Roberts-Thompson has a wonderful way of making what she calls her Dragon Stone collar tutorial. They look it but the "stones" are not protruding from the polymer clay. What she did is to cleverly add different pigments, starting with a metallic silver color into the depressions she makes in the black clay. She has divided the tutorial into two. Part 1 deals with creating the foundation. She explains different ways on how to shape it. The bowl method will need a paper template to help you cut out the shape. She mentioned this blog post which has a template (as well as others) you can use. Her preferred method is to use a metal collar as the form. I looked around and did find an inexpensive one on eBay. Or you can get this mirrored version here. Part 2 shows how to use the inks to make this collar pop! H/T to Aims for the last find. The versatility of polymer clay is absolutely endless! All of these look like lots of fun to make!